Meet Pokemon Trainers Black and White. His entire life, Black has dreamed of winning the Pokemon League. Now he embarks on a journey to explore the Unova region and fill a Pokedex for Professor Juniper. White has an exciting career as the Trainer of a talented troupe of performing Pokemon. She dreams of making her Tepig Gigi a star. 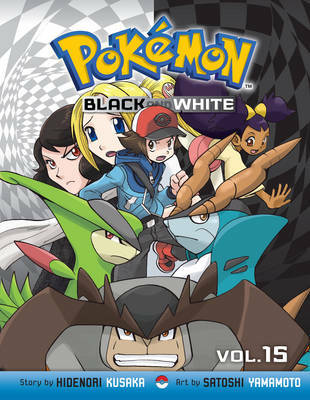 Together, Black and White continue on their journey... What surprising new Pokemon - and people - will they meet next?! How can Black convince a group of bitter Pokemon to trust people again? And how can Trainer Alder convince Team Plasma leader N that the Pokemon League exemplifies the powerful bond between Pokemon and their trainers? Then, it's Black and White - together again! Now how will our friends rescue the kidnapped Gym Leaders...? Plus, meet Cobalion, Virizion, Terrakion, Twineedle, Megahor and...Serperior and Samurott?! Not to mention the new rougher and tougher Gigi? !